The Tacker is a useful device that will control the tack of a cruising or conventional spinnaker by fastening it loosely over a furled headsail. It prevents the tack from blowing off to leeward. In addition to improving performance it also prevents the tack line from loading against or chafing the pulpit and lifelines.The Tacker is a ABS plastic saddle that distributes the load over the furled headsail without chafe or damage. It’s easily attached and will slide up and down according to how you trim the spinnaker. 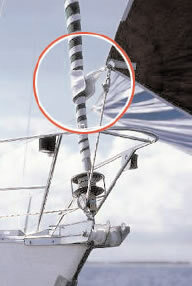 The Tacker can also be used to set a conventional spinnaker without using a pole. This positions the spinnaker tack just as if the pole were brought forward to the headstay (as you would do on a reach). Of course you can fly a spinnaker without a pole or the Tacker, but bear in mind that a conventional spinnaker is designed to fly a couple of feet above the lifelines. Its foot (between the clew and the tack) should always be horizontal. Securing the spinnaker tack to the deck is not the best way to set the sail. It is too low and the spinnaker will chafe on the bow pulpit and lifelines. If you add a pennant or a downhaul, the spinnaker falls off to leeward and the pennant chafes on the pulpit and the sail looses its shape.That's when the Tacker saves the day. It holds the tack, and the luff, of the spinnaker close to the centerline of the boat and it can be adjusted up and down with the downhaul for a perfect trim. The Tacker is fitted with a snapshackle which allows the operator to blow the tack of the spinnaker, making it even easier to control the sail.